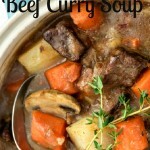 Beef Curry Soup, yummy and fragrant simmering in the Slow Cooker = a little bit of Heaven here on earth! The enticing aroma of this slow cooker beef curry soup simmering will bring the family promptly to the dinner table. This is comfort food with an exotic touch. It’s almost May here in the North Maine Woods but the weather has been cold and rainy. We even had a snow storm a week ago! This seems like it has been an endless winter and today we have a cold, bone chilling drizzle and gloomy skies. It’s the perfect day for a warm comforting soup so I have just finished filling the slow cooker with a batch of Slow Cooker Beef Curry Soup. I’ll be serving the Beef Curry Soup with a nice crusty baguette spread with garlic butter and toasted under the broiler for a few minutes. It’s a meal that always puts a smile on Bill’s face and for me. that’s a good thing! 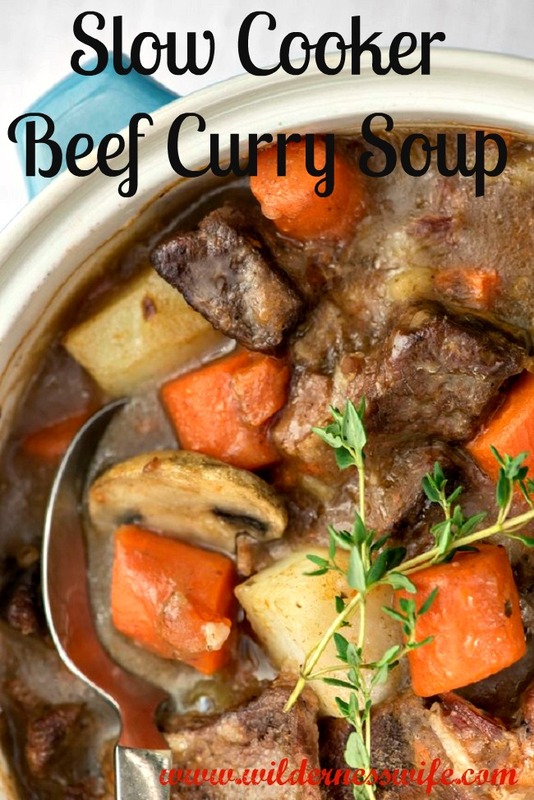 This is hearty and tasty slow cooker beef soup that will please any comfort food fan! Dredge stew meat in flour and place in skillet. Add onions and celery. Cook all until meat is browned on all sides.Remove meat, onions, celery and place in slow cooker. Take 1 cup of beef broth and add to skillet to deglaze pan. Be sure to use a wooden spoon to loosen all the delicious bits of brown goodness from the skillet and then pour skillet content into slow cooker. Pour the remaining 3 cups of beef broth and water into the slow cooker. Add salt, pepper, curry, bay leaves and thyme sprigs to slow cooker. Add carrots, potatoes, mushrooms and tomatoes. 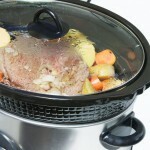 Set slow cooker to low and cook for 6 hours. Taste before serving for seasoning. Add aditional seasoning if needed. I adore beef stew and crockpot cooking! This looks so delicious! Thank you for linking up at #PureBlogLove link Party. The party goes live every Thursday night at 8 p.m. EST. and runs through the weekend. I’m hosting over at http://www.homemadefoodjunkie.com. I hope you come link up another great post! There is nothing better than a slow cooked meal and I have been making more of them as of late. This look so good it is making my mouth water. I have to try this. Pinned to my Good Eats board. Can’t wait to try this recipe. Blessings. Visiting from Do Tell Tuesday. Amazing recipe. Thanks so much for sharing with Wednesday’s Adorned From Above Link Party. 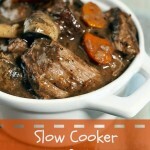 I love new slow cooker recipes, and this one looks delicious!! Can’t wait to give it a try. Just pinned it! I never thought of putting curry in beef stew. Brilliant idea. I love warm and delicious stews and this one looks perfect! So nice stopping by to visit! Your beef soup looks delicious! Trying this recipe for sure.